Bobby the puppy was just five days old when he was found on a roadside near the body of his mother, who had been struck by a car. Fortunately, he was discovered in time and brought to the safety of the Michigan Humane Society. To ensure that Bobby received all the nourishment and affection he would need to survive, staffers at the shelter hoped to place him with an adopted mother dog, but there were none. That's when something beautiful happened. 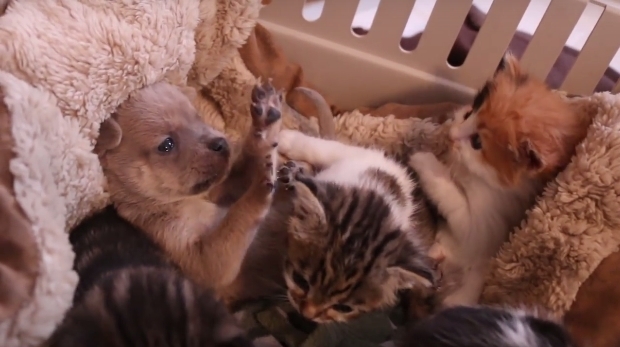 A sweet cat named Gwen, who had just given birth to a litter of kittens, decided to welcome the lonely pup into her family. Gwen isn't the only one who's come to accept the little dog as one of her own. Her kittens, too, have come to regard their adopted brother as their sibling all the same. That means Bobby's getting plenty of snuggles ...It's been a little over a month since the puppy was rescued and welcomed in by the family of cats. Bobby is currently in foster care, but when the time is right, he and his brothers and sisters will be adopted out to loving homes. Responses to "Puppy Who Lost His Mom Finds A New Family To Snuggle With"